ABOVE: La Renaissance accommodates eight guests in four large staterooms. Most barges carry only eight to 12 passengers, and some are designed for as few as six guests. This makes them ideal for private cruises by families, groups of friends, or even well-heeled honeymooners and anniversary couples. Mind you, a private barge cruise doesn't come cheap: You can easily spend anywhere from US $15,000 to $60,000 on a six- or seven-night charter, depending on the barge and the number of passengers. Although such fares sound expensive, they're competitive with per-person fares on luxury cruise lines. What's more, the rates cover nearly everything except crew tips (typically 5 to 7 percent of the fare), including the services of a personal chef, fine food and wine, shore excursions, and drinks. For more information on private charters, click the links in our directory of Hotel Barges in Europe. 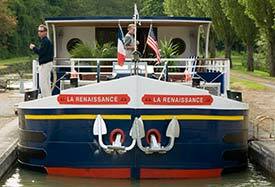 And again, browse our La Renaissance cruise review to get a feel for what it's like to explore European canals or rivers in a hotel barge.